After the British electorate voted to leave the EU in June 2016, many people, particularly on the losing Remain side, searched for someone to blame. David Cameron was a favourite, as he was the one who allowed a vote on the issue. Various politicians on the leave side were also singled out for allegedly misleading the public. In reality, however, the 2016 referendum result was the natural outcome after decades of massive constitutional change undertaken without the express consent of the British people. When the people got a vote on the issue, they finally decided that enough was enough. So how did it all come to this? In 1972, the UK, Norway, Ireland and Denmark sought to ratify the Treaty of Accession and formally join the European Community (EC). Norway held a referendum, and upon this being rejected by its electorate, did not ratify the treaty. The United Kingdom, with a new Conservative government led by Edward Heath, brought forward legislation to accede to the EC without consulting the people. Heath refused to consult the electorate partly because he knew he would lose. Notes attached to the European Communities Act 1972 recorded that it was passed “against strong public opinion”. Polling following the accession in 1973 showed the people thought it was wrong to join the EC, at a majority of almost two to one. — John Pardoe MP, debating in the second reading of the European Communities Bill in February 1972. — Hon Nicholas Ridley MP, debating in the third reading of the European Communities Bill, in July 1972. Despite such reservations, the bill narrowly passed. Without the consent of the electorate (and with the electorate arguably against such a policy) the UK joined the European Community in 1973. With a change of government in 1974, the new Labour administration fulfilled a manifesto promise offering the people a referendum on EC (Common Market) membership. This would be the last time the people would be allowed a direct say on the issue until the 2016 EU referendum. Remainers were aware that they had to change public sentiment towards the EC. And they did just that – through massive public spending, a sustained campaign of Project Fear, and fundamental dishonesty about the true goals of the EC with regards to ever closer political union. The imbalance in spending between Remain and Leave in the 1975 referendum campaign was truly gigantic. The Remain group, “Britain in Europe”, raised £1.5m (over £11.5m today), whilst the Leave group, “British business for World Markets”, raised a paltry £8,000 (plus £125,000 in government grants, which were given to both sides). Financial contributions made by BP and Sainsbury’s alone were more than three times the size of the entire amount raised by the Leave campaign. — Peter Shore, speaking at the Oxford Union in 1975. — Edward Heath, speaking in a television broadcast in 1973 to mark the signing of the Accession Treaty. This started a series of misleading statements meant to change public opinion into supporting “Remain” in the referendum. These claims that the nation’s sovereignty was safeguarded was a continued theme throughout the referendum. Transfers of sovereignty, as well as Economic and Monetary Union (EMU) were ruled out, despite “ever closer union” featuring heavily throughout the Treaty of Rome, the document signed by the six founding members. In response, the public voted to remain in the EC by over 67%. It would be the last time they were directly consulted on the issue until 2016. Leaflets given out in the 1975 referendum for both campaigns. Although voters in the 1975 referendum believed that EMU and further monetary union were off the table, planning began for the UK to join the ERM (Exchange Rate Mechanism). This was a system to peg exchange rates of different countries to a small band based on the European Currency Unit, which would eventually become the Euro. James Callaghan sent David Owen to negotiate the UK joining the ERM in 1978, only three years after the referendum had been secured with promises of no further EMU. The UK did not join the ERM when it started in 1979, but in the 1980s the Treasury started an unofficial policy of “shadowing the Deutschmark”. The Prime Minister Margaret Thatcher, after long periods of opposing EMU and the newly created Maastricht treaty, was removed by the Europhiles in her party and replaced with John Major in 1990. Major signed the UK up to joining the ERM officially in October 1990, without public consultation. It ended up as a disaster, with Black Wednesday and the UK’s withdrawal from the mechanism in 1992. Under the Maastricht Treaty, the European Community morphed into the European Union (EU). A new single currency, the Euro, was formed and the treaty committed member states to further economic and political integration. Many member states, including France, Denmark, and Ireland, held referendums. There was an argument in the UK for a referendum as well, however these were resisted by the government. The call for a referendum had some merit, especially as the preceding general election had seen all major parties commit to ratifying the Maastricht Treaty, meaning that there was no democratic choice to oppose it. Many people, including historian Vernon Bogdanor, made the case that the public should be consulted regarding the Maastricht Treaty. — Vernon Bogdanor, writing in favour of a referendum in 1993. The government ignored these calls, and forced the treaty ratification legislation through parliament. The “Treaty on European Union” was ratified in Maastrict in 1992 without public consent. 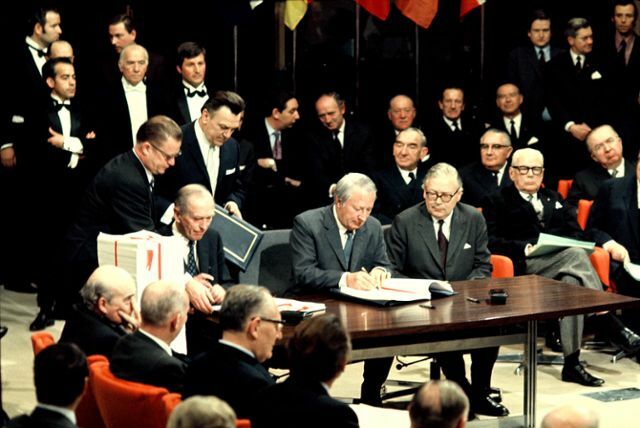 The signing of the Maastricht Treaty, in which the modern EU was formed. The millennium was ushered in with New Labour in power, and they made repeated promises to give the British electorate a long-overdue say on integration with Europe. In 2004, a new EU treaty called the “Treaty establishing a Constitution for Europe” (commonly referred to as the European Constitution or as the Constitutional Treaty), arrived on the agenda. The Prime Minister, Tony Blair, twice argued that the Constitutional Treaty should be put to the people in a referendum. In April 2004 he told Parliament that it should debate the European constitutional question “in detail and decide upon it” and “then let the people have the final say”. However following the rejection of the Treaty by French and Dutch voters in 2005, the treaty was amended, and the British referendum was cancelled. Europhiles were not to be put off following this setback. 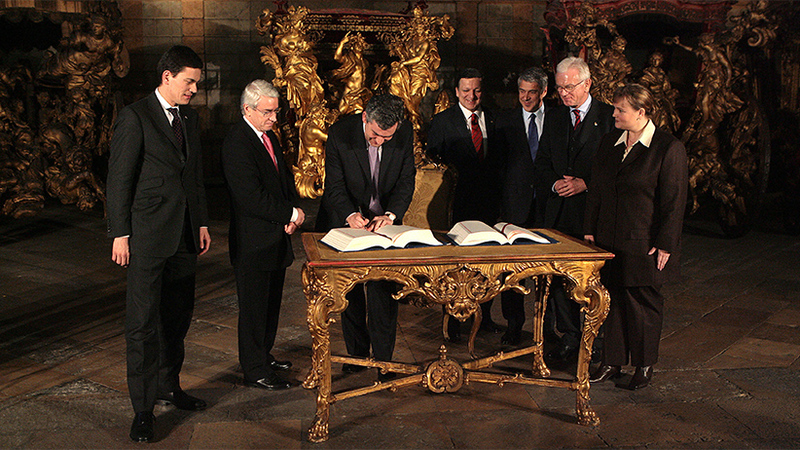 In 2007, the Treaty of Lisbon was drawn up, and signed by member states in Lisbon. Eurosceptics in Parliament were furious that commitments to consult the public had been cancelled, and then backtracked on entirely. — John Redwood MP during the second reading on the Lisbon Treaty, January 2008. Although the treaty was little changed from the failed Constitutional Treaty, it was described by the EU as an amendment to the Maastricht Treaty (the Lisbon Treaty was also known as the Reform Treaty). The position taken by the Labour government at the time was that, as this was merely a reform treaty, no national referendum would be required. As with Maastricht, the government continued to resist calls for a referendum, and the legislation passed through parliament. Further integration with the EU, as well as legislation which transferred the primacy of legislative power from London to Brussels, was agreed to by politicians, once again without public consultation. The treaty came into force in 2009. It is clear that since we joined what we were told was a Common Market, pro-EU politicians have sought to avoid direct consultation with the British electorate regarding the EU, preferring instead to give away power and promote further integration through stealth. For the first time since 1975, the people were given a vote in 2016, having been deceived and lied to for decades, and voted “Leave”, giving a mandate to the government to undo decades of sovereignty transfers conducted without public consent. The blame for this lies not with the Leave campaign and eurosceptics, but rather with Remainers who have forced through integration policy for the past 40 years. An absolutely first class piece of work. I voted Leave to prevent my county from becoming a province of a new state clearly being established. Having given us the sovereign people a referendum on IN or OUT our poxy Priminister is ignoring our clear democratic choice to completely leave the Eurpean Union by expecting us to accept an IN OUT fudge. No way is this acceptable. So is there legal precedent which over rides the position we find ourselves in at present ) I would like to know the answer to that also David , and if we could as a country , walk away legally , giving the EU nothing , because those who signed away our sovereignty had no authority to do so, with permission from the people. I’ve been saying much the same since I was conned by Heath, Wilson and the rest into voting Yes in 1975. A decision I’ve bitterly regretted never since. Now the “Establishment” led by the PM, are once again trying by all possible means to deny the will of the voters. Good piece, I wasn’t taken in by the lies in 1975 and have been against the EU ever since. Unfortunately I think the forces working for the NWO are too strong and we will never escape. Any chance this will “aired” on the UK media? No thought not.